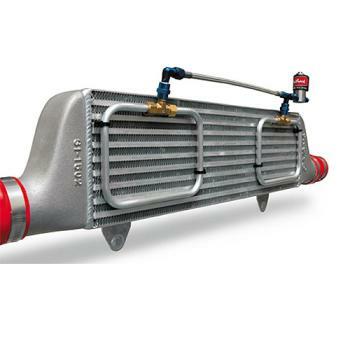 These systems purge N2O or CO2 on an air-to-air style intercooler for turbocharged vehicles (Bar and plate or tube and fin). This results in a colder, denser air charge increasing engine horsepower and lowering the chances of detonation. Chassis dyno test showed increases up to 15 HP on a 2000 Civic Si. These systems include all necessary wiring, solenoid, switches, 1-foot stainless steel braided hose and brackets for a complete installation. Match with an Edelbrock Bottle Kit on page 16. Rings measure 5” x 7” and can be oriented to fit most intercoolers.